As we enter 2012 and bid a possibly less than fond adieu to the Pioneer Trail section of the now incongruously named Pioneer Trail game (can we just agree to call it Frontierville? Good.) I thought I might do my own little post mortem of the feature everyone wanted, and no-one probably had a smooth time in. I think one thing that must be pointed out to begin with is I don't begrudge Zynga bringing it out at all. 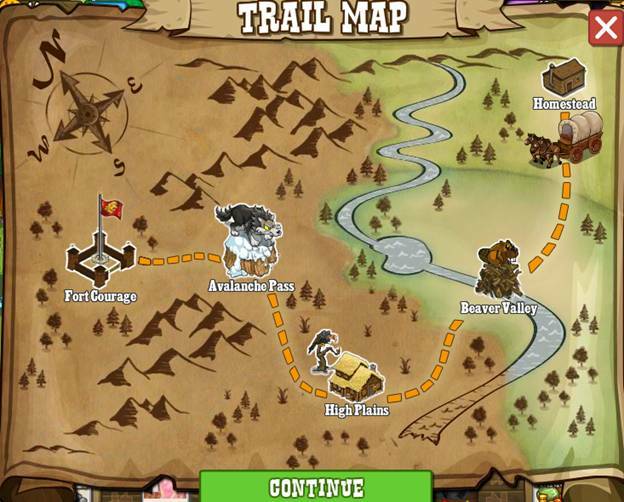 I know a LOT of game issues began around the app change and the subsequent adding of the Trail. A game that was always something of a chubby pup became an overweight dog of a game to play. This, unfortunately, must be laid at the feet of the Trail. 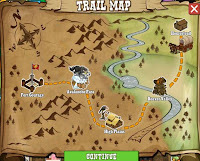 It's no coincidence that as soon as the new app was launched and the Trail was added many folks found themselves unable to play due to problems in performance. All of a sudden Frontierville was a game you needed a great computer to play with any success, and I know of folks who have simply never been able to play since the Trail was launched and the game became more intensive. BUT... as big a but as this needs to be to offset that, the reasoning behind adding the Trail was simple. It was something we'd asked for, it was something that COULD have been wonderful, the developers are constantly pushing the envelope with the game and this was another example of the same. Whether they would do it again looking at the myriad of problems it caused is debatable, I think most people would say no. But doing it in the beginning they could have had no idea what chaos was to ensue, hindsight is 20/20 after all. We're always begging for new stuff, and one of the most popular questions was when the signposts would lead somewhere and when the Trail would open. We WANTED the Trail, and we pushed for it. To be honest Zynga would have been stupid NOT to bring it out. The name change also didn't work. Not only would it continue to be known as Frontierville (a name Zynga perhaps thought was getting a bad reputation) but as the Pioneer Trail was the backbreaker the app soon had a much worse reputation. People couldn't say "Frontierville is a bit glitchy but it's all the Pioneer Trail's fault". The game has had it's PR nightmares since the inception of the Trail and right now it might almost be worth returning to Frontierville, the mud that stuck on that name falls well short of the amount adorning the name Pioneer Trail. What I do know is that we should never berate anyone for trying. It's arguable that the current mood of the players is well into Defcon 1 and the Trail had it's hand in it, but that in itself makes the next month or so rather exciting. Remember for every genius breakthrough there's been something less successful. If a groundbreaking and exciting development follows two failures, then that's a success rate to be proud of, no great invention came without a few singed eyebrows. Faint heart never won fair Fanny after all. So that being said, what about the Trail itself? Just how good was it? How fun was it? If I'm honest, I'd probably give it a 6/10. There were some excellent things about the Trail, but a lot of that was offset by issues or by bad decisions regarding missions and requirements, the same problems that beset the rest of the game to be fair. As ever with Frontierville the artwork was magnificent, my favourite by far being Beaver Valley, the Plains were a bit brown, the Pass a bit white, Beaver Valley was the sort of place you'd want to go for a walk. We know the one thing that's never skimped on is the art and from start to finish it was very good. The plot was also very good, the storyline, the little mini mission scrolls, the Ezekiel subplot that was criminally underused at Fort Courage... all worked pretty well. The idea of different people having different jobs was also a nice touch, but really should have been done in the same way as the Ghost Town and Hollow, by automatically selecting the one we needed at that time. But here comes the crunch, and to be honest this is easily translated across into problems with the main game, although everything was there for it to be a fun and interesting game... it wasn't. What started out as fun in Beaver Valley (using your different characters to get different things) became tedious by the end of the pass when the same things kept coming back. As fun as it was to pick your Doctor and harvest 10 herbs or grasses in the Valley harvesting 50 trees with him/her in the Pass was painful, especially when you were needing to harvest 50 something else with someONE else. In the end we just did the same stuff again and again, but bigger every time. Obviously in games that will always happen, but because there was so little variation in the Trail it became dull, it was simply a chore. Then the problems that beset the entire game, so much requesting, so much building, especially in High Plains. Woe betide anyone who redid the Trail or was slow in doing it (like me). It would take days, WEEKS to find enough building materials to finish off the McBaggins Well or the Pass Hideout. And finally, the glitches, oh the glitches! Whether it was the aforementioned hidden missions not turning up, blueberries not returning (and which numpty made you harvest them twice in two missions?) or goats dropping and not geese I think we all had the problems, and nary a day went by without one or more of those questions popping up. The final judgement may sound a little damning, but here goes. 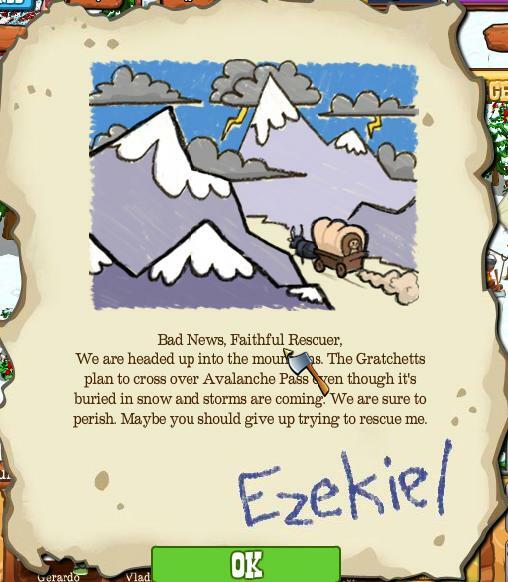 The Pioneer Trail, at large, suffers from the same problems as the entire game does. It sets you up to have a great game, and then things let it down. Mission design, glitches, marketing over gameplay... in the end you're in danger of being disappointed. And THAT is what makes the pain of the Pioneer Trail all the greater, it's like being in a certain type of bad relationship. You love it, you get addicted to it and you want to enjoy your time together. But instead of comforting you, the POTENTIAL of what it could be, the occasional glimpse of greatness, added to the often misguided excitement of a new feature makes the whole thing worse because you see what the pair of you together could be... but are beaten down too often by the disappointment and anti-climax. All we can do now is look ahead to what's next, and even though we know we shouldn't, like a sports fan at the beginning of every season, we'll look forward with hope and optimism, even though we hate and berate ourselves for it, and say to ourselves "this time, THIS time our faith will be repaid". Great commentary and it certainly sums up everything about the game. Personally I did not have too may problems with glitches, but I do find there is too much dependance on neighbours...I would like to see some alternative ways of getting some of the requirements...especially when you need 50 or more to complete a quest! I started the trail for a second time but then got fed up with it. The same with Ghost Town - did it for a while then packed it in. BUT - Holiday Hollow I stuck with ??? Just got a couple more missions to do then will have completed it - odd??? In theory it was great,but when you start off with so little rations and all the stuff they wanted done.Didn't work.I started playing it the day it came out,still never finished with the Mcbraggins' LOL. RIP Pioneer Trail. But Thank you to Zynga for trying.But Frontierville is my fav. ending my third time threw the trail. i know this is not a good thing to admit,but, i have never had any problems with the game other then green screen. went to support chat and after 10 minutes it was gone. it keeps my mind occupied, been playing since it came out. i have no complaints on a free game i choose to play. Wow! That was spot on! Well said. Have really enjoyed the "Trail" in spite of the problems. I feel sad to see it go. 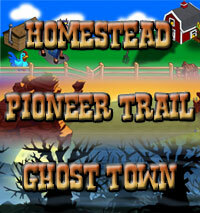 I am wondering why if "Ghost town" and "Holiday Hollow" are working rather well, why doesn't the Trail? Happy New Year to all! Had some teething problems with the trail to start off with, but apart from that pretty smooth. Just wish that ZYNGA would listen to EVERYONE and make it that you don't have to rely on neighbours for the bulk of what you need!! Enjoyed the trail once I got the hang of how it worked. Quit playing about 3 weeks ago (I TRIED to hang in) because of all the problems. They ruined the game. A question only.I lost every gifts in Frontier sent by neighbors in return? Why?? did it twice...i think the biggest let-down was fort courage?? luv this game, but so so so many missions at once, got me playing castleville more and more. hope they get it together!! 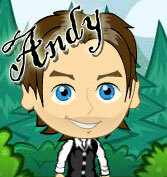 thanks andy great commentary!! I'd give the PT 8/10. I was motivated by my personal need to have the Owl Tree on my homestead for a whopping 9,000 tickets. I was stalking the collectibles like it was my job. Also, I only had one glitch after doing the trail twice. I feel badly for the masses of players that have quit altogether due to poor performance issues with the game. I have a gaming-style laptop with great RAM and a high-end video card, which probably helps me play without issues. I loved the Trail and did it 3 times. All my problems were on my Homestead. I blocked it one day when I got fed up not being able to see what I was doing with those Mastery Boxes following me around. The repeat Crafting Missions were also a nightmare and I just couldn't stand doing them anymore. I blocked it just before Holiday Hollow came out and was tempted back one day but it took over 8 mins to load. I decided once and for all that I didn't need the hassle anymore. Well said. It's a shame though to loose the trail because it did promise so much. I'm currently on my third pass and still loving it. However I do HATE the dependence on neighbours, that seems to be getting more and more! Most of my FB friends have stopped playing as the game is too intense now and that's not only a pain, but very sad. Your posts are always spot on and I enjoy your humor, thanks for the post. Glitchy as it was, Pioneer Trail was at least an attempt to open up a different, more story-driven type of game... a pity it didn't live up to its promise. Zynga also need to learn that people do not want to spend hours at their computers every night begging for hundreds of things to complete a quest.... ESPECIALLY on a holiday!! Just my $0.02 USD worth.